Send us a message, and we'll make sure you get the right part every time. IMS has a specialized resale program for manufacturers! IMS can work with your supply chain and MRO teams to clear space, generate ROI, and help your sustainability initiatives. Send us a message to learn more about how our asset recovery program can work for your business. Subscribe to our news letter for exclusive discounts and special offers! PARLEC DA300-S016 COLLET SET INCR 3/64-1/4X1/64 (14PCS) MFGD. Minimum Collet Capacity (Inch): 3/64. Maximum Collet Capacity (Inch): 1/4. Size 1 (Inch): 3/64; 1/16; 5/64; 3/32; 7/64; 1/8; 9/64; 5/32; 11/64; 3/16; 13/64; 7/32; 15/64; 1/4. The product images shown are for illustration purposes only and may not be an exact representation of the product you will receive. (locations outside the contiguous United States may take longer to deliver). All items are in stock when they are listed. Inventory is tracked and updated regularly. Send us a message to find out more. 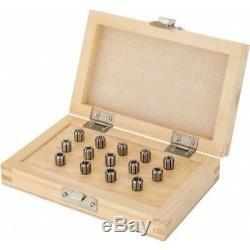 The item "PARLEC DA300-S016 COLLET SET INCR 3/64-1/4X1/64 (14PCS) MFGD" is in sale since Wednesday, September 20, 2017. This item is in the category "Business & Industrial\CNC, Metalworking & Manufacturing\Workholding & Toolholding\Toolholding\Boring Tool Holders". The seller is "imssupply" and is located in Fairport, New York.